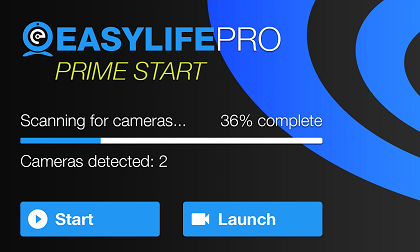 Create an instant cloud based CCTV security system with the Easylife CCTV service. Our cloud console manages all aspects of your cameras, allowing you to control how you capture movement activity. It is permanently synced to your account at easylife.com allowing you to view from just about anywhere. Our one-button Prime Start service means your cameras are automatically detected and connected. 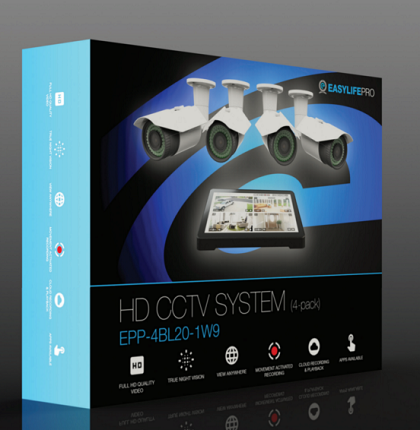 ADD CAMERA - Add up to 8 windows for wired & wireless cameras or screen broadcasts. SHARE ROOM - Share your room with yourself or others and access your room remotely. RECORDING SETTINGS - Set options for recording quality, save locations and more. EXIT DELAY - Set a delay period before movement activated recording initiates. LOCK ROOM - Password protect your room so that only those with the password can access it. MOVEMENT ACTIVATED RECORDING - Automatically starts recording when movement is detected. ASPECT RATIO - Change the aspect ratio of the camera windows to match that of your cameras. OVERLAY TOGGLE - Toggles the overlay buttons between always visible and visible on mouse over. DETECTION GRID - Set areas of the grid that will or will not trigger movement activated recording.